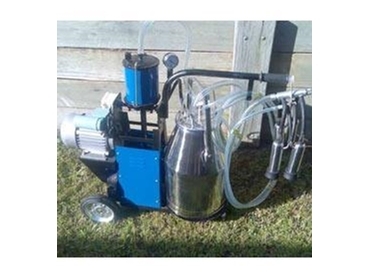 Available now from Dairy Maid Milking Equipment , the Dairy Maid portable milking machine features proven components that make it a reliable, quiet, powerful, and flexible solution for small and hobby farmers. Dairy Maid portable milking machines enable users to milk between six and 10 cows an hour, which is three times more than what the average hand milker can acheive. Add to this it's ease of manoeuvrability, robust and lightweight construction, heavy duty wheels for portability, and minimal moving parts and this cattle milking equipment truly is an ideal, low maintenance solution for today's small farmer. Making the switch from hand milking to milking with a Dairy Maid portable milking machine has many other benefits. Good routines throughout the lactation period help to rduce stress on the herd, which in turn helps to improve milk quality and increase milk yield. The pulsation rate is fixed 660ppm, which is the recommended rate to milk cows. Always staying well balanced, regardless of how full the buckets are, and very quiety to avoid spooking the cattle, the Dairy Maid portable milking machines are easy to use and come with a 12 month warranty on all parts. Dairy Maid Milking Equipment also carry a whole range of spare parts at all times.